The Economist has once again overtaken Private Eye as the biggest current affairs magazine in the UK and Ireland from Private Eye, the latest ABCs show. In the first six months of the year, the UK edition of The Economist sold 236,369 copies – marginally ahead of the Eye on 235,577. The satirical magazine, edited by Ian Hislop, overtook the economically liberal weekly in the last ABC figures, for the second half of 2016. 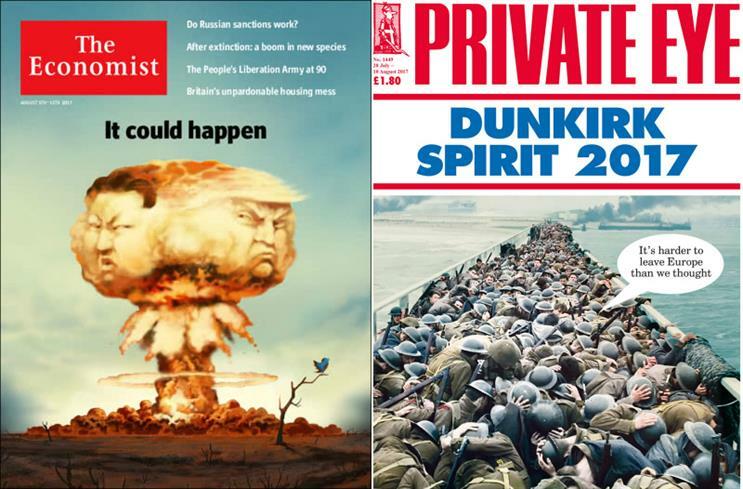 When free copies and sales of the magazine’s international editions are included, The Economist was further ahead, 255,038 to Private Eye’s 235,883. The Economist’s actively purchased copies were up 4.4% on the second half of last year, and up 5.1% year-on-year, while Private Eye’s were up 8.5% year-on-year, but down 0.5% on the second half of 2016. Michael Brunt, chief marketing officer and managing director of circulation at The Economist, said the boost in paid sales had helped the publisher increase circulation revenue by 21% and profits by 52% year-on-year. Brunt said: "Our commitment to circulation profitability continues to succeed as we have doubled profitability over the past two years, making our circulation business become the largest contributor of profits to The Economist Group for the first time in our 174-year history. "We continue to invest across the many digital and offline marketing channels available to us, while introducing new marketing technologies designed to help us optimise our acquisition and conversion activities." The total paid circulation across eight current affairs titles – The Week, Prospect, The Economist, The Spectator, The Oldie, Private Eye, Monocle and MoneyWeek – was 815,802, up 3.3% from last period, and 6.2% year-on-year. The biggest winner by far was Prospect, which increased its actively purchased circulation 64.5% on the previous period, from 18,063 to 29,721. Year-on-year, its sales were up 73.8%. The magazine’s total UK circulation, including free copies, was 38,639. Alex Stevenson, commercial director at Prospect, said the circulation growth had been on the back of effective marketing, a strong reader events programme, and a continued interest in the unfolding story of Brexit. He added that Donald Trump’s election had given the magazine "a massive boost" initially, but Brexit was proving to be the issue that was now driving reader interest. He said that despite the challenges facing print media, he hoped advertisers would take notice of the magazine’s growing audience: "If organisations are looking at relevance, this shows we’re going to the right kind of people that certain advertisers want." The only other title to grow its paid circulation was The Spectator, which sold 68,420 copies, up 10% on the prior period, and 15.2% year-on-year. Most other current affairs titles saw circulations fall slightly on the previous period. The Week was flat on 148,277 paid copies; The Oldie was down 0.2% to 40,694; Monocle down 1.1% to 11,994; and MoneyWeek down 1.2% to 44,750. Men’s lifestyle titles, meanwhile, experienced steeper declines – especially Men’s Health, down 15.9% to 99,419 actively purchased copies, and Esquire, down 13.3% to 25,419. Across four paid titles measured – Men's Health, GQ, Esquire and Wired – actively purchased sales were 216,827, down 11.2% on the previous period, and down 14.7% year-on-year. Duncan Chater, chief brand officer, luxury, young women and wellness at Hearst, which publishes both Men's Health and Esquire, said that the figures for actively purchased copies did not fully represent the performance of either title. "Esquire continues to innovate in print through partner marketing programmes, which are actively chosen and paid for by the consumer, and standalone brands such as The Big Watch Book," Chater said. Men’s Health also has partner marketing programmes, which he said were actively chosen by the consumer but not reflected in actively purchased numbers. Chater added: "Both brands are innovating and significantly growing their audiences across multiple touchpoints, including digital and events such as Esquire Townhouse and Men’s Health Survival of the Fittest." The circulation of leading free title Shortlist dipped 0.3% to 503,089.